The ultimate seabird quest for a magnificent species seen by few birders: Emperor Penguin! Variable fee depending on cabin choice. As of this writing at the beginning of March 2019, there's space available to join Field Guides leader Tom Johnson (a.k.a. the Albatross) and Oceanwide Expeditions on the trip of a lifetime to search for the legendary Emperor Penguin in Antarctica. As an exciting update, Oceanwide Expeditions made successful visits to the Snow Hill Island Emperor Penguin colony in the Weddell Sea in both 2017 and 2018. While a successful visit to the colony is not guaranteed due to ice and weather conditions, the success of the past two years has sharpened our optimism for this year. Emperor Penguins need little introduction -- the world's largest penguin species, they breed in some of the harshest conditions experienced by any bird. You've met them through "March of the Penguins," "Happy Feet," and countless other television documentaries. But how to see them? Most voyages to Antarctica only scratch the surface of the ice continent and have only a minimal chance of finding Emperor Penguin. Like our other Antarctica departures with Oceanwide, this cruise will begin and end in Ushuaia, Argentina. However, unlike our other Antarctica departures, this cruise prioritizes "time in the ice" in the Weddell Sea and Antarctic Peninsula, and does not visit the Falkland Islands and South Georgia. This means that we will maximize our time searching for Emperors in their world -- we hope to find these massive, iconic penguins while at sea in addition to attempting to visit the breeding colony. We'll also have two opportunities to sample the wonderful pelagic seabirding and mammal-watching opportunities of the famous Drake Passage. Our ship will be the ice-strengthened M/V Ortelius, a vessel we know well from our previous cruises to Antarctica and the Norwegian Arctic. This is a special tour that we are unlikely to offer on an annual basis because of the highly focused itinerary. Accordingly, if you're interested in visiting Antarctica's Emperors with the Albatross, please contact the Field Guides office soon. We are excited to offer our inaugural Field Guides tour to the Weddell Sea in search of one of the world's most iconic and difficult-to-reach birds, the Emperor Penguin. 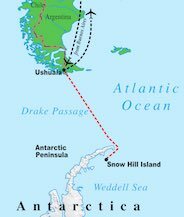 Partnering with Oceanwide Expeditions, we will journey south from Ushuaia, Argentina, toward Snow Hill Island in the Weddell Sea, east of the Antarctic Peninsula. We will be aboard the 91-meter-long, ice-strengthened M/V Ortelius, a ship with countless Antarctic voyages under her belt (see a gallery of images of the ship). One of the exciting features of this vessel is its ability to carry two helicopters, which will be used to search for Emperor Penguins. If ice and weather conditions allow, we will use the helicopters to shuttle to a site near an Emperor Penguin colony at Snow Hill Island. We will then hike to the colony and enjoy these magnificent birds (with their chicks) up close and personal. Note, however, that because of the extremely remote destination of this voyage and the varying weather and ice conditions, it is possible that we will not reach an Emperor colony, though we dearly hope for the opportunity. Although there are no guarantees, Oceanwide reports that "during our previous voyages we have had a high success rate in locating Emperors." This is definitely an adventurous and ambitious itinerary with flexible daily plans structured to take advantage of local conditions. Unlike our longer Antarctica tour (which has a very low probability of seeing Emperor Penguin), this voyage will not visit the Falkland Islands or South Georgia, opting instead to maximize time in the Weddell Sea. After leaving the Weddell Sea, we plan to stop at the South Shetland Islands en route back to Ushuaia. The seabirding and marine mammal possibilities while at sea between Ushuaia and Antarctica are extensive. We are very excited for this chance of a lifetime to go to the land of the Emperors, and we hope that you'll join us!